You are working with an application. You open it, make some changes, and then you close it. That is a session in it’s simplest form. The example scenario is reminiscent of the process that happens when using a login system. The process can be extremely complicated or incredibly simple, as long as there is a value that persists between requests. Information stored in the session can be called upon at any time during the open session. While there may be many users accessing the site at the same time, each with his own session, it’s thanks to unique IDs assigned and managed by PHP for each session that allows each user’s session to be available only to himself. Session information is stored on the server rather than the user’s computer (as cookie data is stored), which makes sessions more secure than traditional cookies for passing information between page requests. In this article I’ll give you the low down on using sessions in PHP – how to create them, how to destroy them, and how to make sure they remain secure. session_start() starts the session between the user and the server, and allows values stored in $_SESSION to be accessible in other scripts later on. In your second file, you call session_start() again which this time continues the session, and you can then retrieve values from $_SESSION. This example is a very basic demonstration of storing and retrieving data in a session. In the first script, the value “Callum” was associated with the key “username” in the $_SESSION array. In the second script, the information was requested back from the $_SESSION array using the key. $_SESSION allows you to store and retrieve information across the page requests of a user’s active browsing session. As important as it is to begin a session, so it is to end one. Even though a session is only a temporary way to store data, it is very important to clean up after yourself to ensure maximum security when dealing with potentially sensitive information. It is also good practice and will avoid having a huge amount of stale session data sitting on the server. Both examples only affect data stored in the session, not the session itself. You can still store other values to $_SESSION after calling them if you so choose. If you wish to completely stop using the session, for example a user logs out, you use the session_destroy() function. I highly recommended that when you are sure you no longer need the session that you destroy it using session_destroy(), rather than just unsetting all of its values with session_unset(). If you just unset all the value, the session itself is still active and malicious code could give those sessions harmful values. That is sessions in a nutshell, the very basic but very powerful functionality within PHP that provides an elegant solution to the problem of passing data between web pages. Despite there simplicity, there are still ways using sessions can go wrong. Here is a quick overview of some security techniques you can use to ensure you are using sessions safely. // calculate the session's "time to live"
The code ensures that if there is no activity for more than 600 seconds (10 minutes) the request is redirected to the logout page which would successfully log out the user. As I previously mentioned, you should use session_destory() once you don’t need to use the session any more. This stops attackers from hijack the stale session, again increasing the session-related security of your web site. Use a database to store data at the earliest moment you know the data will be persistent; don’t let it stay as part of the session for too long as this opens it up to possible attack. Really think about whether the data belongs should be stored in $_SESSION because session data is meant to be transient. And if you enjoyed reading this post, you’ll love Learnable; the place to learn fresh skills and techniques from the masters. 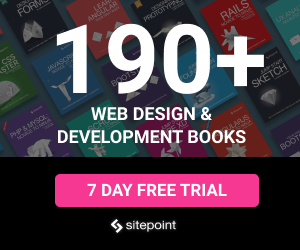 Members get instant access to all of SitePoint’s ebooks and interactive online courses, like Jump Start PHP. Comments on this article are closed. Have a question about PHP? Why not ask it on our forums?